1957: CBS aired the last episode of daytime soap Valiant Lady. 1985: General Hospital's Celia and Jimmy Lee married. 2007: Guiding Light's Olivia ran into Reva during Josh's wedding. 2007: One Life to Live's Asa Buchanan died. 1957: The final episode of daytime soap opera Valiant Lady aired on CBS radio and television. The show, which debuted in 1953, was a follow up to the radio soap opera of the same name that ran from 1938 to 1952. Flora Campbell starred as Helen Emerson during the show's final three years. 1971: On The Doctors, Dan told Steve that he wanted to make peace. 1976: On Another World, Iris (Beverlee McKinsey) complained about Rachel to Therese. "Daddy always loved me until Rachel trapped him," Iris said. 1977: Legendary singer and entertainer Elvis Presley died. His ex-wife, Priscilla Presley, later starred for several seasons as Jenna Wade in Dallas. Former Loving star Susan Walters played Priscilla in the 1988 television movie Elvis and Me. 1979: On The Edge of Night, Miles (Joel Crothers) tried to soothe a dying Louise. 1984: On Days of our Lives, Hope (Kristian Alfonso) helped Bo (Peter Reckell) steal the prism. 1985: On General Hospital, Celia Quartermaine (Sherilyn Wolter) and Jimmy Lee Holt (Steve Bond) were married. Meanwhile, Prescott Harrell (Robert Newman) held Holly Sutton (Emma Samms) hostage. 1985: Diana Webster made her first apperance as Lavinia Peach in Days of our Lives. 1989: On As the World Turns, Duncan (Michael Swan) pulled Jessica (Tamara Tunie) into a kiss. 1989: Actress Amanda Blake died at age 60. Best known as Miss Kitty on Gunsmoke, she played Dr. Julianna Stanhower in The Edge of Night in 1984. 1991: Jensen Buchanan played the role of Marley (Love) Hudson on ANOTHER WORLD for the first time. She had debuted as Vicky on July 25, 1991. 1993: Actor Tom Fuccello died at age 56. He played Dave Culver on Dallas, Paul Kendall in One Life to Live, and Mark Elliott on Love is a Many Splendored Things, and also appeared in Knots Landing and Falcon Crest. His final role was Randall Kirby in The Young and the Restless. 1999: On One Life to Live, Dorian (Robin Strasser) found a crying doll on her doorstep. 1999: On As the World Turns, Lily (Martha Byrne) and Holden (Jon Hensley) decided "Faith" was the perfect name for their switched at birth baby, and Lisa (Eileen Fulton) offered Carly (Maura West) a job as the Mona Lisa's Ladies Room Attendant. 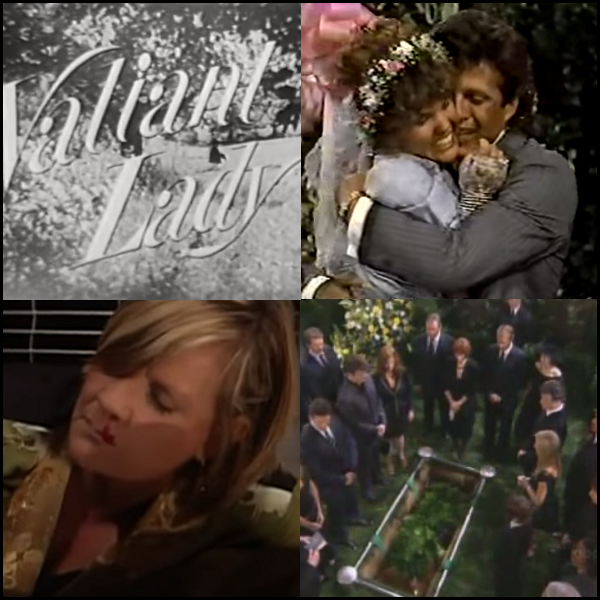 2000: On The Bold and the Beautiful, Stephanie (Susan Flannery) plotted to terminate Morgan's (Sarah Buxton) pregnancy by secretly slipping Morgan an abortion drug that she had obtained from Bill Spencer, Sr.
2001: On The Young and the Restless, Ashley (Eileen Davidson) told Traci (Beth Maitland) that Colleen was becoming a bit too attached to Brad. 2002: On Passions, Tabitha (Juliet Mills) was unable to make a martimmy without Timmy. 2007: On Guiding Light, Josh and Cassie were almost married but Olivia (Crystal Chappell) hit Reva (Kim Zimmer) with her car before they could finish the ceremony. 2007: On One Life to Live, Nigel discovered that Asa Buchanan had died. Clint (Jerry verDorn), Bo (Robert S. Woods) and the rest of Llanview mourned the loss of Asa at a funeral service. This was OLTL's 9,999th episode. 2012: Actor William Windom died at age 88. His soap roles included Amos Krebs in Dallas, Mayor Virgil Mapes on The Yellow Rose, and Charlie Banks in Flamingo Road.